Emily Freeman’s latest book, A Million Little Ways, is a work of art. Rather, she declares that YOU are a work of art, a poem breathed out by our Creator to live as that masterpiece everyday. 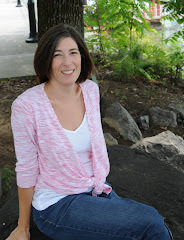 Throughout, the reader is encouraged to examine self and “uncover the art you were made to live”. Notice that she does not implore us to find the art we were meant to make. By looking within, back, up around and beneath we begin to discover our art so that we may release it into the world for the benefit of others, and ourselves but ultimately to reflect the glory of the One who made us. Just as a tree grows up strong, with deep roots and reaching branches, it does not shy away from its form, coloring or changes through seasons. It is always what it was meant to be and eventually becomes more than just a tree. I wasn’t sure if I would finish the book for stopping every sentence to ponder or pray. Once I did make it to the end, I immediately turned back to the beginning to start again. I think you may be inclined to do the same. This morning on the radio I heard a new-to-me song by Josh Wilson titled Pushing Back the Darkness. Just as God’s glory and work may be expressed in a million little ways, we are able to come up with a million little excuses to hold it back. 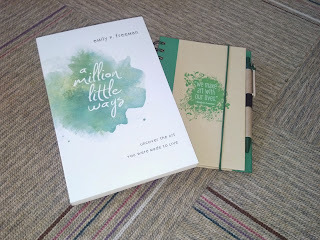 Give a listen then keep going to find out how you can win a copy of A Million Little Ways and a matching journal. I heard Emily speak on the radio a few days ago and just loved her views on life and how much God sees us as His works of art. I would love to get this book and journal, what a great offer Amy! Thanks! I find that this is all so doable and practical in the everyday. Amy, I love when a book does that to me! I sometimes find myself underlining most of a book! I have gone through a couple books years later and found it neat to see what impacted me the first time! Reading it the second time with highlighter in hand! Yes- I feel exactly the same way. But I am quite convinced that I would have enjoyed the reading of this book much more if I had the matching journal to go along with it!!! :) Love you friend! It really has changed the way I think about so much of my everyday life. Beautifully written as well. Running makes me feel most alive! Writing makes me feel the most alive. For sure. Working outside in the garden, or in the yard. Even if it's mowing! Singing... With ThE Radio Up Loud And Tbe Windows Down. Giving birth was pretty amazing! Looks like a beautiful book too. I feel most alive when I'm actively in the moment! Playing with my grands, painting my next project, talking with someone special. 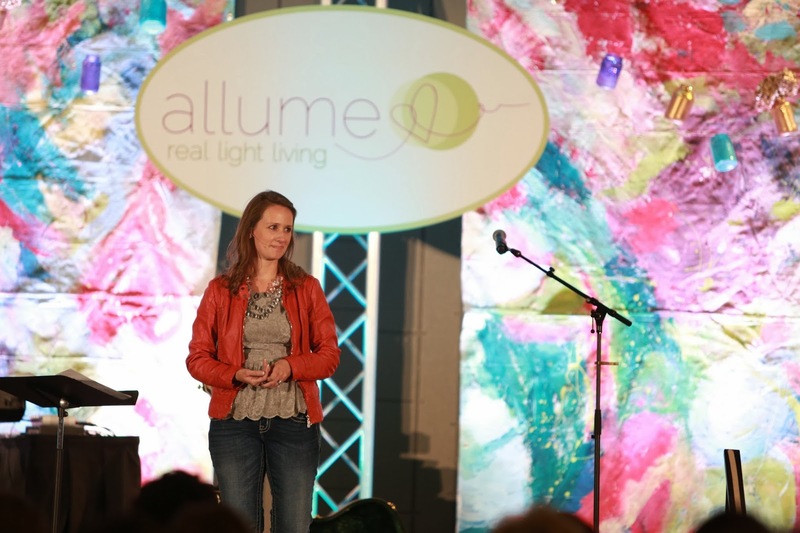 I am SO going to Allume next year! It is so much more than 'just' a blog conference! Love that book still chewing on her words, so much to ponder. I feel most alive in the cool of a quiet, early morning. I feel most alive when I'm out in the open, taking photos and absorbing the wonder of God's creation. Writing. Writing exactly how I feel, in that moment. And I love your review of this book!